This year's Distance Nationals were held at Big South Fork National River & Recreation Area in Tennessee. They provided some of the deepest competition in the past several years. Even with the challenging terrain, an average 80% of the Arabian and Half-Arabian/Anglo-Arabian riders completed in good condition. Sudi Lenhart and A Long Way to El Paso won the AHA Purebred 100-Mile Championship in 13:17. The also received Best Condition honors. Margaret Clare Summers and LR Georgie Girl were Reserve Champions. There were 9 starters and 5 completions. 4 starters, 4 completions. Lori Dinkelman and DCL Mooi Roccoby Baby were Reserve Champions and Best Condition winners. Heather Reynolds and Bound for Honor were the AHA Purebed 50-Mile Championship winners in 5:10. Barbara Hershberger and Kenlyn Irishman were Reserve Champions. There were 14 starters and 13 completions. Best Condition went to fourth place Cheryl Newman and JS Comet. Wendy Justice and Rococo Amber were the AHA Half-Angle Arabian 50-Mile Championship winners in 6:17. They also won the Best Condition Award. Margaret Clare Summers and Mardi Gras Tuesday were Reserve Champions. There were 6 starters and 5 completions. Jitske Miedema-Staker and CR Mighty Grace were the AHA Purebred CTR Champions with a score of 193.50. Reserve Champions went to Jean Shaw and AM Radiant Force. Cheryl Van Deusen and Snake Eyes Leroy were the AHA Half Anglo Arabian CTR Champions with a score of 196.00. Reserve Champions were Nancy Sluys and FYF InZane+/. Claire Taylor, a senior at North Hunterdon High School, finished the 2015 Tevis Cup, a 100-mile endurance test for horse and rider, in 21 hours, 4 minutes in August. The Tevis Cup, held in the Sierra Nevada Mountains in California, is the oldest modern-day endurance ride and the inspiration and model for the most challenging endurance rides worldwide. In the 60 years this event has been held, only 2,360 people have managed to complete the ride, which follows a rugged portion of the Western States Trail once used by gold and silver miners during the 1850s. Endurance riders may covet the discipline’s reputation as an extreme sport, but the American Endurance Ride Conference's "gateway" event, the 25-35 mile limited distance ride, is well within the reach of most well-conditioned trail horses. As the usual stepping-stone to endurance riding, limited distance rides are popular with those new to the sport, riders with new horses, and young and older riders. Some who join AERC move up right away to the endurance distances of 50, 75 or even 100 mile rides, while many are content to stay with what is often called "luxury distance." Riders have six hours to complete a 25-mile ride, although placings are given and the top ten finishers are able to compete for the coveted best condition award given out at each AERC event. Equines of all types are welcome in AERC rides, as long as they are 4 years old for LD, 5 years for 50-75 mile rides, and 6 years old for 100-mile rides. AERC’s motto means everything to participants: “To finish is to win." AERC's Fall Special allows new riders to join for the remainder of the 2015 ride season and all of the 2016 season (12/1/15-11/30/16) for $88.75. "We're also welcoming new 2016 memberships, which are $63.75, a 15% discount off the renewal price thanks to sponsorship by EasyCare Inc.," said AERC Executive Director Kathleen Henkel. "You have to call the office to take advantage of the Fall Special—866-271-2372—but you can join online for 2016 through our www.aerc.org website." Members of the organization range from 5 years old to early 90s. As with many horse sports, membership skews older but, according to Henkel, "We are seeing an influx of younger new members in the last year or two which makes us quite positive for the future of endurance riding." "I am so happy to have found a group of people that put their horse first for once and go out of their way to help newbies like me," said new member Maria Phillips. A mentoring program, a new rider handbook, educational materials and a subscription to the monthly Endurance News magazine welcome those new to the nonprofit organization, which has been going strong since 1972. "I've ridden jumpers and hunters since the age of 9, and I was converted into a die-hard endurance enthusiast by a wonderful mentor who invested an entire year into getting me trained up," said 20-something rider Parry Kietzman. "Mentoring is what made all the difference to me and I hope I'll be able to pay it forward some day for some other young kid." "It's a very much individual sport on the trail. Just you and your horse and maybe a partner or two, but in camp it's relaxing and telling stories and hanging out. It's people helping other people, it's competing against yourself, it's all hands on deck to provide the best of everything for the horses. "It's groups just for newbies, where experienced seniors hang out just to answer questions and help you come along. It's people reaching out and taking you under their wing, answering your questions, giving advice, talking you down off the ledge, getting you through, cheering their guts out when you succeed, huddling with you when you fail. "It's control judges telling you your horse looks great. It's a cold bottle of water at the end of 10 hours of dusty trail. It's volunteers holding your horse so you can pee, or your hair so you can vomit. It's the ride meeting, and the ride sharing, and the completion awards that aren't worth $10 but are priceless and irreplaceable. "It's the trails you would have never seen, the achievement you would have never guessed you had in you. The pride in your horse, the gleam in his eye, the fog, the dawn, the steam, the sweat, the sunshine, the rain. Triumph and overcoming and enduring, and loading up to go home while you pull up the calendar to find your next ride. "It's addictive, indescribable, painful, exhausting, exhilarating, freedom and achievement." If that description intrigues rather than repels, contact the AERC office to receive a "Discover Endurance Riding" booklet or to sign up for membership. Sometimes it takes a raging catastrophe to put things in perspective. It all started with another one of those LD/Endurance discussion-turned-arguments on Facebook. Emily Pendergrass, a new member of AERC and an endurance riding "prospect", chirped up in the discussion with what she thought was a humorous reply. "I jokingly posted that I lost all my horse tack," Emily says, "and can I do a ride without tack?" That eye-popping statement caught the instant attention of endurance rider Aurora Grohman of Oroville, California. 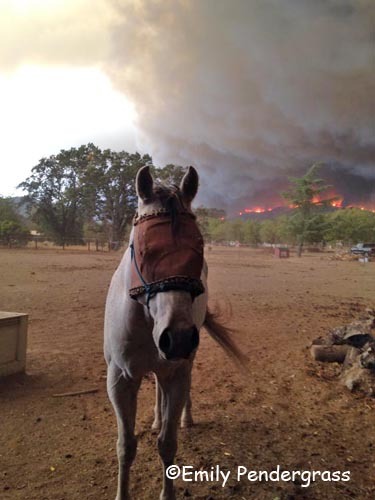 As the two began corresponding, Aurora learned the full extent of Emily's traumatic situation: living in Middletown, California, she'd just lost her barn and all her tack in the devastating, ongoing Valley Fire in Lake County, California, just hours after the blaze started. Though she saved her horses and her house was damaged but still standing, Emily says pragmatically, with a sense of humor, "I finally had all the tack I wanted, a lot of brand new tack I had just bought; I was finally ready to go on my first endurance ride. It was just bad timing basically!" 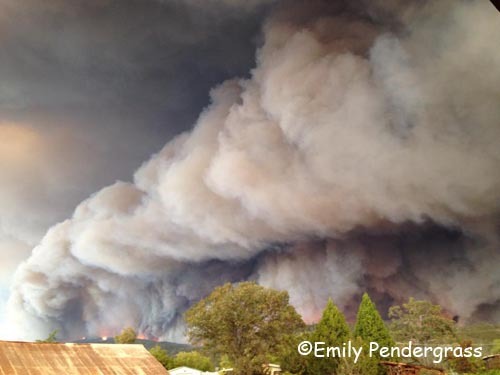 Emily recounts the terrible day: "I was home all day Saturday (September 12). It was a 100 degree day; it was really windy, strangely windy, and it was overcast. I started seeing some brown smoke against the overcast. I wasn't sure if it was a fire, but I kept an eye on it. "We didn't have any time at all. I think the fire started around 2:00; Middletown got a mandatory evacuation at 6:30, and I threw my horses in the trailer and we headed out of town. We had to stop at another ranch to pick up horses, and we got out of town by around 7:30. So there was not a lot of time for people to prepare for this. "It moved so quickly. I could see flames coming down the hill, and it was dark by the time we left town because the smoke was so dark. But you could see the fire really well, it was just a half mile away from where we were loading horses. I have honestly never felt such impending doom. It was a pretty intense situation, for sure. I'm not surprised people had trouble getting everything out, there just wasn't time." Aurora felt an immediate kinship with Emily and those affected by the Valley Fire, because she knows herself exactly what the threat of fire is like. "There's literally an 800 acre fire that's 4 miles from my house right now," Aurora says. "And that's the fifth fire that's been within 5 miles of us this year. When it's close it's terrifying." "I thought, well, shoot, many folks just lost everything. So there's a lot to be done, but I figure I know horse people who have spare gear, and I'm in a huge horse area over here, so let's see what we can put together." What Aurora quickly organized was a network of fellow endurance riders and other horse people, setting up tack collection spots. "We've got a box happening at Virginia City 100 (September 19, in Virginia City, Nevada). We've got a collection happening at Cuneo Creek ride (September 19 and 20 at the Humboldt State Redwoods Cuneo Creek Horse Camp, California). I've got boxes happening from pretty much Sacramento up to the Redding area." And despite her losses, now that Emily is out of danger, she's also turned her attention to helping others affected by the fire. The disaster is not over: Tuesday evening, 3 days after the fire started (the cause is still under investigation), the fire had burned 67,200 acres with only 30% containment, with 585 homes and hundreds of other structures destroyed, with 9000 more structures under immediate threat. After the collections, Aurora will drive up to meet Emily with the donated tack, and when Emily is allowed back into her town, she'll connect with her neighbors. 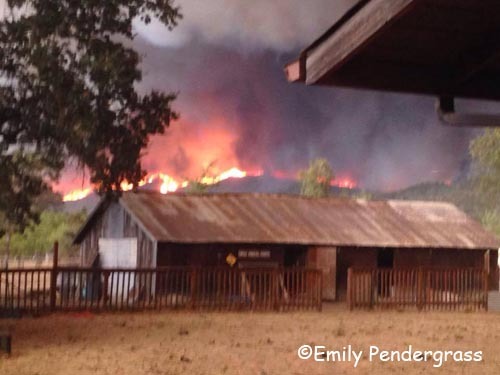 "I know personally a lot of barns that were burned down," Emily says. "There's this awesome woman who does a lot of lessons for kids. She couldn't even get most of her horses out. They grabbed a couple dogs, and a couple horses, and they had to leave, and she lost everything - so I really wanted to help her out. And I have a lot of contacts already of people who lost their barns, so I'll be able to call them all and say, 'What do you need!?'" When dreadful disasters like these pull the endurance and horse communities together, it suddenly doesn't matter if you are a 100-mile rider, or an LD rider, or someone who has yet to begin her endurance career, or a trail rider, or a rodeo queen. "It's rough…" Emily admits, "but I'm not even worried. Look, we're the lucky ones. We have our house. So many people i know - like my neighbor right across the street, her daughter is the current California high school rodeo queen, and all their trailers melted or were completely destroyed. They lost everything. It's sad. and I know plenty of other people that are in the same boat." Aurora rather shrugs off her quick and benevolent efforts to help Emily and other fire-ravaged equestrians. It's just common sense. "I'm not even sure I've met Emily in person," Aurora says, "but endurance is that kind of community. I know others would do it for me, so I'm doing it for them." You can do a lot in 24 hours. Go to work, get dinner, take a walk or, if it’s a particularly lazy weekend, go on a Netflix/ takeout binge. If you’re Marci Cunningham, though, you just might spend 24 hours on a horse, riding 100 miles west from Robie Park near Truckee to Auburn. The long journey of the Western States Trail Foundation’s Tevis Cup, held once a year on the weekend closest to the July full moon, is a feat for any horse and rider. Starting at 5:15 a.m., the endurance ride covers valley and mountain terrains, with some paths wide enough to accommodate a few horses and others so narrow that only one at a time can pass through. Riders and horses go up rocky cliffs, skirt the edge of tall mountains and cross the American River. Molly Caldwell is happiest when the wind is pulling at her hair, the terrain is gliding beneath her and when her movements are in sync with those of her horse. Caldwell is one of only a few people in the Rome area who regularly participates in endurance riding — an equestrian sport based on controlled long-distance races. She packs a tent and loads up a trailer and is gone for days at a time, traveling to events throughout the southeast where she and other endurance riders compete, testing themselves and their horses while enjoying the beauty of the outdoors.